Canadian Wildlife Federation: Can boats harm loons? I saw a mother and its baby swimming this summer and a boat went by quickly engulfing them under water. They never reemerged. Can boats harm loons? I saw a mother and its baby swimming this summer and a boat went by quickly engulfing them under water. They never reemerged. A. Common Loons are admired by many Canadians – seen as a symbol of solitude and really, nothing compares to that haunting call! And how lucky are we that approximately 95 per cent of the world’s Common Loons breed right here on Canada’s lakes – that’s nearly 250 000 pairs! Building their nest close to water, two eggs are commonly laid in June and hatch about a month later. While chicks can swim right away they are unable to dive quickly and will often take rides on their parents’ backs to rest, stay warm and to avoid predators. But our love of having fun on the water with motor boats and jet skis can spell big trouble for loons. Even, sometimes, canoes and kayaks. While these generally cause less disturbance, they can still have an impact if we get too close to shore. Personal watercrafts and motor boats can reach high speeds, create large wakes and can get close to shorelines disturbing nesting loons, knocking eggs out of nests, even flooding nests. Non-motorized boats can disturb nesting loons by getting too close to shore. Disturbing a nest can cause the adults to leave the nest, disrupt incubation and leaves the eggs unprotected and vulnerable to predation. 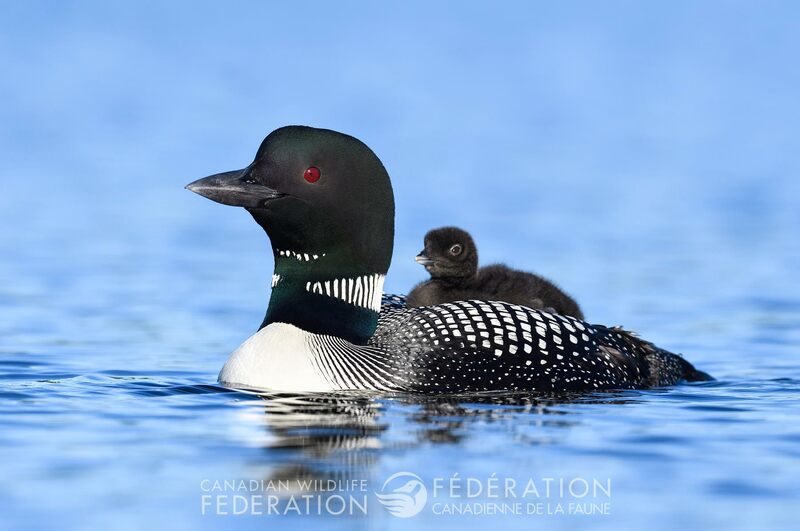 Once chicks have hatched and are on the water, boats can cause loon chick mortality if they become separated from their parents, they can even become injured or killed from boat propellers. Boat collisions are another source of mortality for both chicks and adults. So how can we still enjoy our beautiful summers and keep loons safe? Keep an eye out for them! Small lakes, typically between five and 50 hectares, usually only have one pair of loons. However, larger lakes can accommodate more than one pair of breeding loons with each pair laying claim to a particular bay or section of the lake. If you see a loon with its wings raised or a loon raised out of the water with its wings held tightly against its sides, bill held low and close to its chest – these are signs that the loon is in distress. Keep your distance, especially if there are chicks, and if you can, don’t get too close to shoreline areas during their nesting and breeding season. Which whale gives birth to the largest babies?